Snow came late to Maine this year, pounding us in February and continuing right through press time, long after the calendar start of Spring. A Series II-A takes a long time to warm up on a winter’s day, even with my Mt. Mansfield heater from Rovers North. The “demisting” function won’t work until the engine warms up sufficient to produce heat, so you spend a lot of time brushing off snow and scraping off ice. It’s during winters that my dreams turn to more “modern” Land Rover models. I own two 1966 vehicles, both with engineering from the 1950s, and a 1980 vehicle whose design barely made it into the 70s. Dare I move ahead to the 1990s, or even the 21st century? A glance at my bank balance and I might enter the market just slightly above “parts car.” With another Series Land Rover awaiting a new frame, I hoped to find a “ran when parked” Land Rover. The stories of enthusiasts who bought forlorn Land Rovers and drove them vast distances home resonated in my heart. 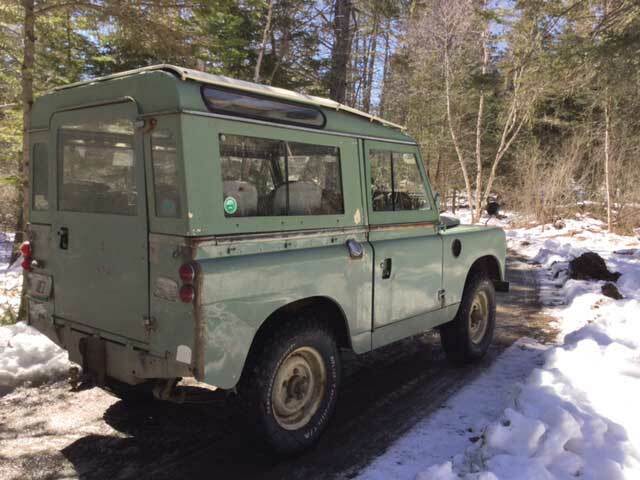 Bruce Fowler of Maine Winter Romp fame is legend for spending minimal dollars on Land Rovers and Range Rovers that he runs on pennies. A couple of Decembers ago, I drove Rovers North’s Zack Griswold from Vermont to Auburn, MA, to pick up and pay for a Discovery I from Portland, OR. The trucking company yard looked as forbidding as the salvage yard in the remake of The Italian Job. Many stern-looking men spoke loudly into their cellphones in multiple languages. A lot of nice cars with active, out of state registrations, sat on the lot—why? Night had fallen and Zack’s “new” Discovery sat forlornly in a dark recess. It required assistance from a jump pack to fire up, but once started, Zack then drove 4 hours to home without an incident. He’s still driving it today. Why can’t that happen to me, too? Why do my automotive purchases invariably morph into stories of breakdowns and rescues? One reason must be that I’m a sucker for Land Rovers with stories behind them. When the owner becomes dewy-eyed while reciting its travels and sniff, sniff, announces selling it would be painful—except, of course, to a good owner—well, I start to feel honored that someone would even consider taking my money. Add another few hundred dollars to the price when I find out they’ve given the Land Rover a name. The search of forums, Land Rover Facebook sites and Craigslist yields some opportunities in my price range, one that’s more Timex than Rolex. 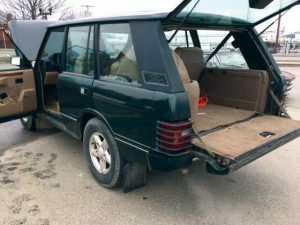 In Maine, I found a ’95 Range Rover Classic that drove quite nicely and had only a modest list of “these don’t work” accessories. The owner had bought it for his son to use as a “safe winter car.” It even came with a valid inspection sticker (although it had been granted by the very used car dealer who sold it). The Classic also came with some inner wheel well rust and signs of some dubious structural repairs. Oh, yes, and close the rear tailgate with care so as not to crack the frame. Outside of Washington, DC, I found a ’97 Discovery I with no structural rust that had seen recent life as an equestrian’s work truck (as evidenced by the hay and straw sprinkled throughout the car). It would come with a name (“Monty”) as well as the need for a new starter and fuel pump; a test drive was out of the question. It also came with a beseeching call for an “owner who would really care for it.” Mind you, animal shelters use the same tactics to convince potential owners that they might, just might, sell you the pet your child tearfully requests you bring home. Stay tuned—the QE I and the QM I might welcome another member to the fleet. As you see elsewhere in this issue, the Maine Winter Romp provided extra time for contemplation in the woods due to extreme amounts of snow. When not shoveling out stuck Land Rovers, I made myself comfortable inside the Discovery of Bob Vail, Cumberland, ME. If Bruce Fowler reigns as the founder/president of the Winter Romp, Bob surely has achieved the standing of Romper Emeritus. His daughter Hallie and son Nate attended the Romp as children and have brought their own Land Rovers as adults. It would be a day for diversions in between shoveling, towing and winching, and one of the more enjoyable was breakfast at the legendary Big G’s—just the kind of diner to fill you up. From the parking lot I heard powerful, crystal clear music. This lot was filled with Land Rovers, only a couple with contemporary sound systems. Surely this quality was not emanating from the AM-FM cassette deck on a NAS 90 or Range Rover Classic. Ah, but it did come from the Defender 110 of Joshua Frances. Sitting on his center cubby is a DemerBox, a Bluetooth sound system in a waterproof, weather-resistant box with a big voice. Joshua, of Brunswick, ME, has worked for 20 years in the disaster relief field. He has spent a lot of time in Land Rovers and noted, “You can’t hear anything in a Defender, so having premium sound is fantastic. The utilitarian aspect of the DemerBox is the key. It’s the Defender of speakers—rugged, not the sexiest, but very premium and it doesn’t leak oil. 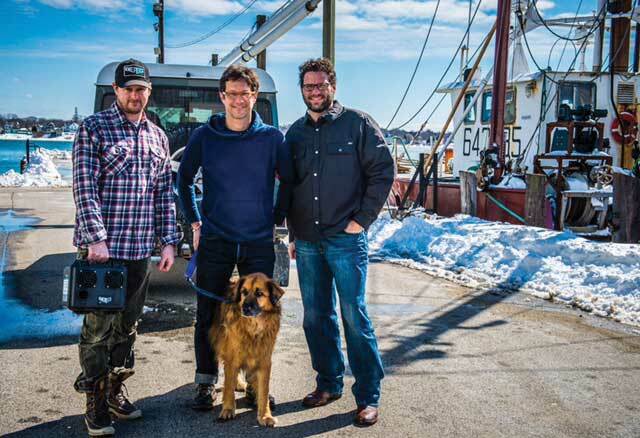 After jobs as varied as futon maker, bike mechanic and hot air balloonist, in 2010, James Demer, Portland, ME, found himself working as a sound engineer on a feature film in Barrow, AK. “I needed a playback device for a scene,” he told me, “so I took a Pelican Case, cut holes in it, and mounted an amplifier and speakers. It worked great, and we used it every night to listen to music. Everyone wanted to buy the prototype.” James started working as a sound engineer by selling his car to purchase his first sound equipment, and it’s his expertise that guided the first prototypes of the DemerBox. He constructs each box himself. His partner on the DemerBox is Jason Lobozzo, Cape Elizabeth, ME. The freelance cameraman has worked with James for 15-20 years. “I went to borrow some cross-country skis. When I arrived at James’, he was covered in plastic shavings. He pointed to the first DemerBox and said, ‘I need $10,000.’ I returned with the skis and the cash. We’ve had our heads down refining and building these since 2013. We build them in Maine from parts sourced in the US.” The waterproof DemerBox measures 10 x 11 x 7 inches and will play via Bluetooth or a standard audio cable from any digital device. It can run 54 hours on one battery charge. The question is, would it work over the din in a Series II-A? Justin Alley, Windham, ME, works as the Parts Manager for Jaguar Land Rover Scarborough, my state’s only dealer. 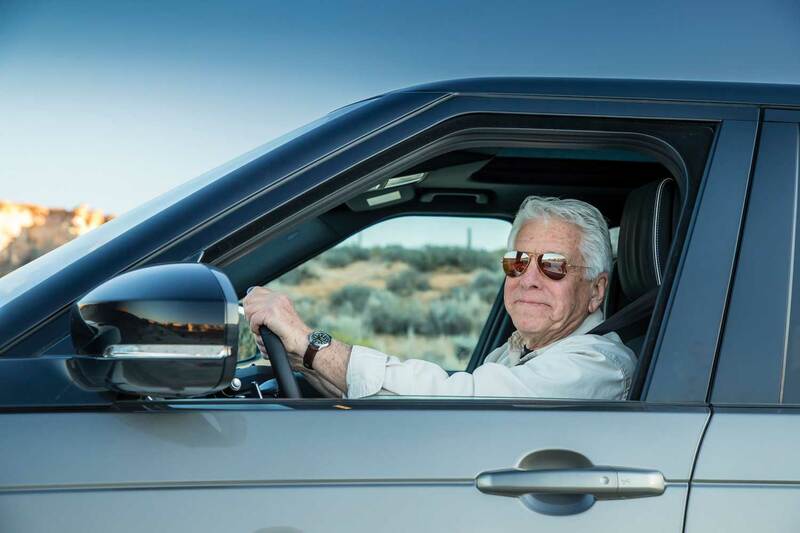 Back in February, he flew to to Tucson with Service Manager Dan Babb to participate in Land Rover’s dealer introduction of the New Discovery. Their dealer launch took place in the Saguaro Nation Park outside of Tucson, with about 50 miles on-road and plenty of off-road time. The trails were shared that day with a local off-road club running Jeeps and Toyotas with giant tires, even some snorkels and lift kits. They appeared quite annoyed to find new vehicles on the trail, and jeered at the Land Rover group to “get your Mom’s car off the trail!” The more beer the locals drank the more the Land Rover group thought to let them go through, but when the Land Rover off-road instructors offered to spot and Judie them down the trails, the offer was met with derision and the local club members smashed into obstacles along the trail. One new Toyota truck ripped a fender, angering a spouse. Another blew up a power steering pump. The sight of the stock Discoverys conquering the challenging trail without drama amazed the local clubbers. What he found most delightful was that at a time when the UK was assaulted with “all that SUV’s-are-Satan stuff, you get benign smiles and old-fashioned courtesy.” He’s quite right. Working on your Land Rover might well drive you to drink, and one hopes that at times, the choice is coffee. Shayne Young and his family started out overlanding from New South Wales, Australia, and wound up in the US. 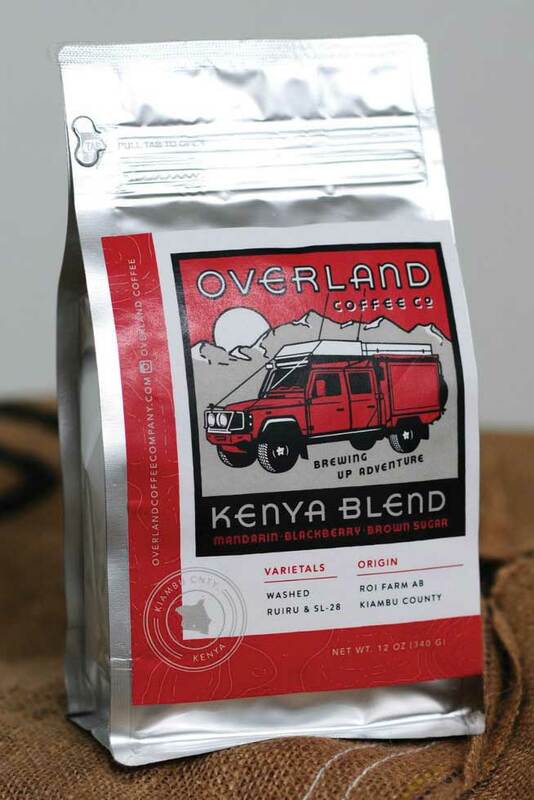 Funding any overlanding is always a challenge, but he’s found a supporter in the Overland Coffee Company. They promise to “brew up adventure” with their two blends, roasted and drop shipped the same week anywhere in the world to overlanders. One bag of Expedition Blend went to correspondent Alaina Poole, Pinson, AL. Running Poole’s European and Vintage Cars in nearby Birmingham requires a lot of coffee. She pronounced it “a true taste of caffeinated heaven!” She used a hand grinder to prepare the beans for brewing in her cappuccino machine. “Opening the bag, the aroma was sweet with hints of chocolate. The blend of beans from Central America, South America and Mexico had a lively, crisp, sweet, full bodied flavor with light undertones of molasses. I would give it an 8 of 10 on a boldness scale. It really got me going on the rainy mornings when I can’t seem to get up and go.” I enjoyed the Kenya Blend, finding the blend a medium roast in terms of color and strength, with a hint of sweetness. It was a nice change from the dark French Roast and Espresso Roasts I have each morning. 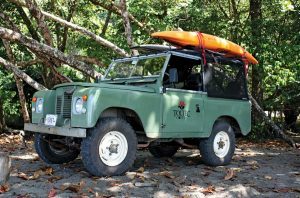 Niall Johnson, Belmont, MA, merged his interests in Costa Rica, coffee and Land Rovers into a business for himself when he created Toltec Coffee. He grew up with Land Rovers as his family worked for the ironically-named High Performance Cars, which sold Marcos, Peugeot and Land Rovers out of Waltham MA. A visit to Costa Rica resulted in the adoption of a 1976 Series III 2.25 diesel. It struggled with steep roads there so it wound up exported to the USA. Now he enjoys two Series II-A’s. “They’re everywhere in Costa Rica,” Niall said in a telephone interview. As Niall and his wife traveled to Costa Rica over the past 20 years they became fascinated with the many varieties of coffee beans grown there. He met a business partner, Jose Alvarado, and together they formed Toltec Coffee. It’s sold in Costa Rica so that Americans vacationing there will want to find it in the USA. Right now, that can only be done online through their website. His Expedition Blend features a 109” on the bag; the Safari Blend was created for travelers who require a high-pressure espresso bean. The beans come from Costa Rica and Nicaragua right now, but Niall is experimenting with different beans and blends from other locations. He uses a roaster in Central Massachusetts for freshness, keeping his stock small and no more than 90 days in age. For more information, visit www.demerbox.com and www.overlandcoffee.com.